Where does San Diego County get its drinking water today? 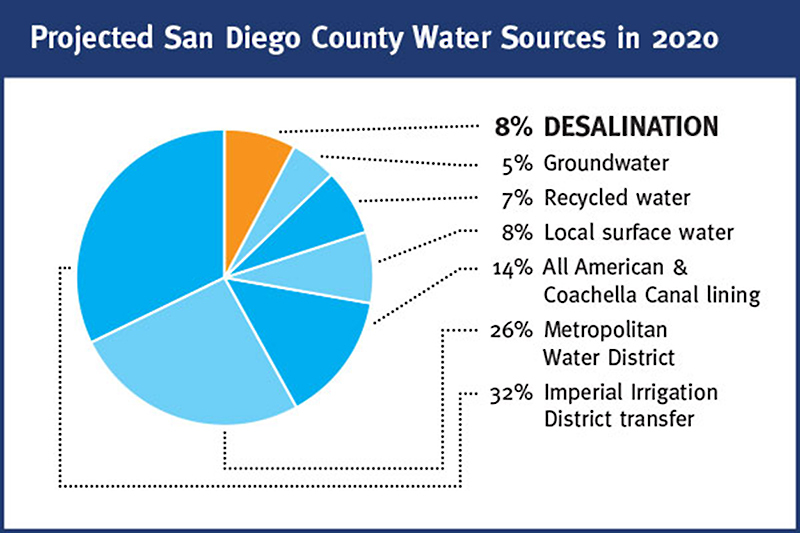 A single supplier, the San Diego County Water Authority, historically imported up to 90% of the region's water from the Colorado River and Northern California. The rest comes from groundwater, local surface water, recycled water, conservation and NOW seawater desalintion. Why is seawater desalination better than importing water or relying on other supplies of water? The Pacific Ocean represents the ultimate drought-proof resource. The desalination plant provides San Diego County water agencies complete control of a local drinking water supply that is not dependent on local rainfall, snowpack in the Sierras or outside suppliers. Diversification and local control are essential to good planning and self-sustainability. That is why the San Diego County Water Authority has declared desalination to be its "preferred alternative" to diversify its drinking water supplies. What impact will desalination have on our long-term water supply? The Carlsbad facility provides up to 50 million gallons per day of safe, sustainable, environmentally benign, drought-proof drinking water. It offsets some of the need for imported water and provides more than 10% of the region's drinking water, alleviating demand on the traditional sources, and contributing to the regional supply. Where is the Carlsbad Plant located? The Plant is located on an existing industrially-zoned site adjacent to the Encina Power Station on the coast in Carlsbad, California, approximately 35 miles north of San Diego. What is Poseidon's relationship with the Encina Power Station? Poseidon Water is an independent company but has entered into a 60-year lease on the project site with NRG West, the owner and operator of the power station. How does San Diego County benefit from the plant? In addition to having a new source of water that is drought-proof, locally controlled and reduces dependence on water imported from Northern California and the Colorado River, the project benefits include an economic impact of 42 full-time employees, supports 500 direct, indirect and induced jobs, and contributes $50 million in estimated annual spending to the county's economy. How long did it take for the plant to become fully operational? Build-out took three years with the plant coming online December 2015. Were city or state tax dollars used for this project? No, taxpayers and ratepayers are not at risk. Poseidon funded the project through the capital markets and contributed equity to the project. Private investors assumed the majority of the risks associated with the project including permitting, designing, building and operating the facility. Has the project caused growth in the region? No. Growth in San Diego County and throughout Southern California will occur in accordance with existing and new land use policies. SANDAG has already projected that the county's population will grow by one million by 2030, with most of that occurring from births rather than in-migration. This project will help meet their needs and compensate for the expected cutbacks of supply from Northern California and the Colorado River. How much water does the plant provide? The Plant produces 50 million gallons per day (mgd) - enough for 400,000 people or 10% of San Diego County's water supply. Does the desalinated water taste different? The water leaving the Carlsbad Desalintion Plant is the higest quality water in the County. Water quality benefits are being seen across the county from Oceanside down to the Mexican border. What state agency will provide oversight to ensure a safe, reliable drinking water supply for San Diego County consumers? The California Department of Drinking Water (DDW) issued its approval for the Carlsbad Desalination Project to produce drinking water prior to the plant coming online December 2015. ​When the Encina Power Station is decomisisoned, how will the plant be affected? In the event that the power plant was to close, Poseidon acquired the first right to use the power station intake and outfall facilities, to continue full operations for up to 60 years. The desalination plant would not be significantly affected if current operating conditions at the power plant were to change. Poseidon and the City of Carlsbad have always anticipated that the desalination plant would eventually outlive the Power Plant. The City took the initiative during the environmental review process to extensively study the desalination plant's impact to the environment under the scenario where the power plant is not operating. The City’s certified EIR concluded that the desalination plant can operate without significant impacts to marine life. Regardless of if, or when, the sea water-cooled power plant is decommissioned, operational restrictions and monitoring and reporting requirements to ensure there are an abundance of water quality and marine ecosystem protections are in place. Poseidon is currently designing and permitting a new state-of-the-art intake system to be constructed when the Encina Power Station is decommisisoned and demolished. Why don't cities and water districts develop their own desalination projects instead of relying on a private company? Because development of major projects require significant upfront capital investment and entail significant permitting challenges, a number of municipalities are forming public-private partnerships. The Carlsbad Plant was developed, financed and constructed at no expense to local water agencies or any other governmental entity. This partnership allows the public entities to access the capital and project expertise brought in by Poseidon without incurring any financial risk. It is the epitome of a win-win solution to a critical need for a reliable, long-term drinking water supply.